Diva and Rori spent their first night in their new home huddled in their open carrier on the bathroom floor, too terrified to do much except stay low. 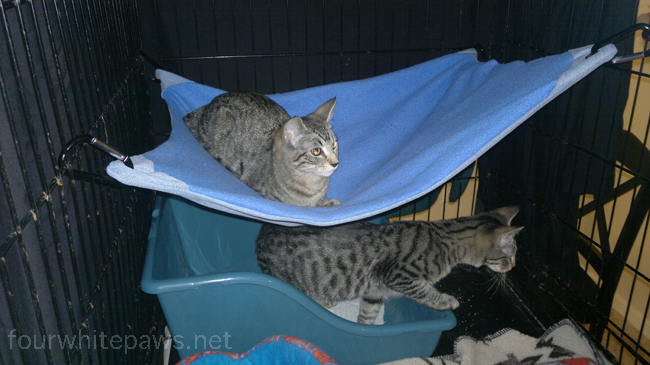 Eventually they moved from their carrier to the covered litter box. Their new humans, Holland and Matt were worried about them, seeing them so scared. To ease the transition, I brought over with a large wire crate, in order to setup a smaller safe space for them to acclimate in. We setup the crate in the dining room on the table, with the kitty furnishings they are familiar with. I moved them to the crate and they did fabulous! It didn't take them long at all to relax, Rori even showed off her mesmerizing purr! When relocating cats to new space, it's best to start with a very small room, like a bathroom. That gives them a chance to get familiar with a small space without being overwhelmed by a full house. 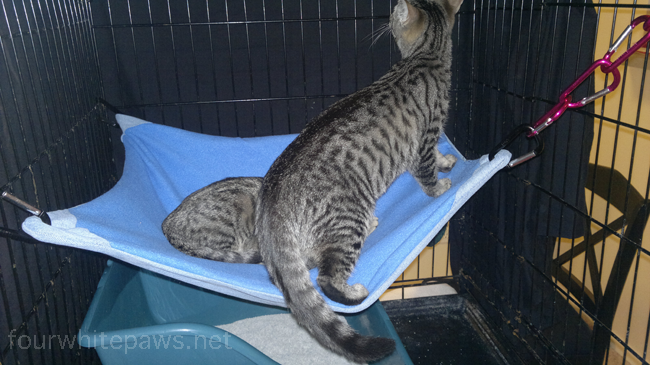 But sometimes with shy cats, even a bathroom is too big, which was the case with Rori and Diva. So, I reduced the size of their territory to the size of the crate. The sheet over the crate provides cover which makes it feel every safer. Once in their new space, they explored it and owned it in less than an hour. 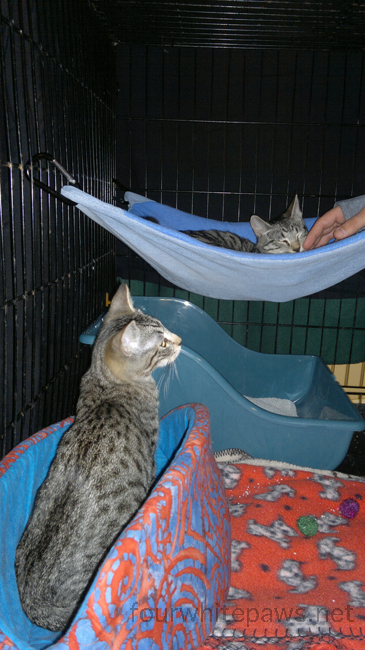 Now that the kittens are feeling more at ease, Matt and Holland can spend time reaching in and loving on them. Soon, they will be picking them up and holding them. In no time at all, Matt and Holland will be their safe humans. As the kittens get more at ease their natural curiosity will take over and they will want to explore their new home more fully. Before I left, Rori was already showing many signs of being curious about the rooms outside her crate. I know I'll sleep better tonight knowing Rori and Diva are comfortable and adjusting to their new home. I'm sure all of us will be sleeping better knowing the kittens are no longer suffering. I'm glad Holland and Matt reached out for help and allowed me to take over their dining room! They will be awesome kitty parents, Diva and Rori have already stollen their hearts! Oh we just LOVE stories with happy endings!!! Oh this is wonderful.We are so glad that the pawrents reached out and that this solution worked out so beautifully for everyone, and we too are sure that they will be out in no time ready to explore their new forever home! We're glad to hear the babies feel snug and secure in their wire cage. They'll be racing around the house in no time! Wonderful! I bet by the end of the week those two will OWN their new house! 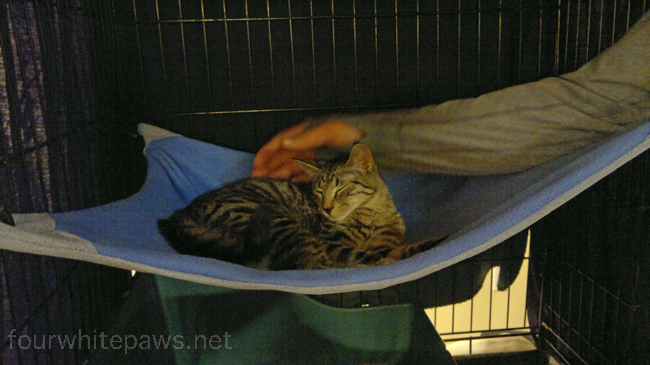 And I love the cage hammock! I'm going to make one for our converted cage. I wondered where you were...I never got notification that you had blogged. But I did come over after I saw your welcome comment this evening. Thank you so much. I am sorry I missed so much. Wow, this is so wonderful. What a great way to end the year and start the new year! Aw, what a good story!!! 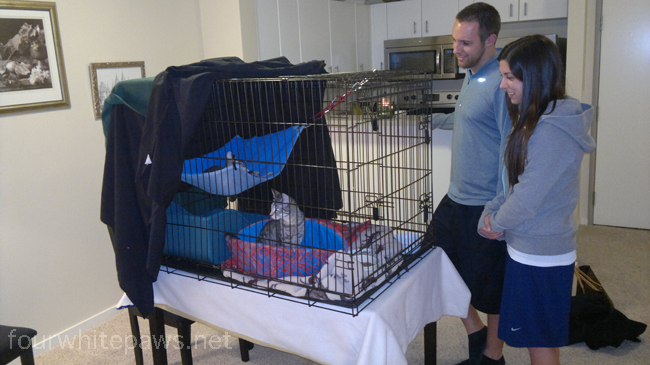 We are sure they will be happy kitties in their new home--they are adorable kitties and the new pawrents look very eager to make them happy. Happy New Year to all! Those two are so beautiful. I am so glad you were able to find them a loving home. And that they get to stay together. That is the best. You really did good by them Phil. Such a happy beginning for Rori and Diva.